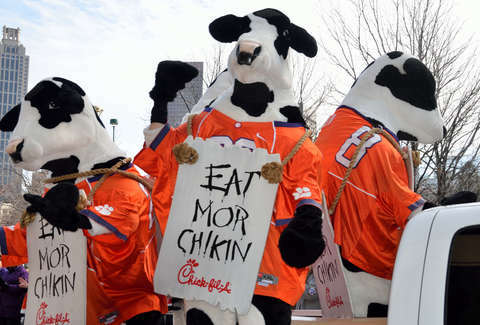 You're probably familiar with Chick-fil-A's odd, but apparently effective, marketing strategy: cows beseeching the public to “eat mor chikin.” Is this an inadvertently dark reflection on how we consume sentient beings to sustain our existence? Sure. Is it so effective that actual cows are apparently influenced by it? Possibly. As you can see in this video (shown below), a rogue cow attempted to take refuge from a police chase in a town north of Indianapolis at a Chick-fil-A. It's unclear where the cow came from. As one of the people in the car that shot the video asks, "Who loses a cow in Noblesville?" Indiana resident Athena Hopkins caught the cow's leisurely but dangerous progress on video and posted it to Facebook, where it's since received over 10,000 shares. Not long into the clip, a police SUV pulls up on the cow, and it picks up its pace across the road. Instinct -- or years of reinforced messaging from the ad campaign -- then took over, and the cow hightailed it to Chick-fil-A. The Noblesville Police Department eventually corned it in the parking lot. But at least it wasn't served as a pickle-topped sandwich?